Meet Dylan Rauch, the skillful craftsman behind many of Nelson Treehouse and Supply’s custom built-in furniture for treehouses around the country. Dylan's meticulous workmanship and eye for design brings beauty and elegance to even the most innocuous of treehouse corners. When he’s not working on new built-ins at our treehouse HQ, Dylan can be found fly fishing in the rivers of the Pacific Northwest. Why is Dylan passionate about fishing? What subject did Dylan spend time teaching in Zimbabwe? And which podcasts are his go-to picks for long days in the shop? Find out below, with ten fascinating things you didn't know about Dylan! Dylan grew up in the suburbs of Boston, Massachusetts. From a young age, Dylan enjoyed building and tinkering – he would deconstruct telephones just to see how they came together inside. Dylan gained exposure to woodworking from his grandfather, who built model ships, and his father, who is an adept handyman around the house. Dylan’s first carpentry job was as a student worker in the theater at Antioch College in Ohio. The creative nature of technical theater carpentry inspired him and he transferred to the University of North Carolina School of the Arts to study technical direction and scenic technologies. Yet by graduation, Dylan felt jaded by the downsides of theater work: the long hours spent inside windowless rooms and the high-pressure pace of production. Dylan left North Carolina seeking a carpentry job that embodied the best qualities of technical theater (principally, its wild imagination) divorced from its sunless working conditions and breakneck schedule. The pace and space of the west coast beckoned, and he landed in California post-graduation. An online search for alternative building work brought Dylan to a website for Pete’s treehouse workshop – the world of treehouse construction certainly fit the bill for creative carpentry. Dylan wrote to Pete, asking for advice on how he might start working on treehouse builds. Serendipitously, Pete and the crew were building a treehouse just a few hours north of Dylan’s home at that time. Within days, Pete invited Dylan to the build for an onsite tryout. The onsite trial was a success, and soon Dylan flew to Virginia to gain experience at a treehouse workshop. By the end of the workshop, he was officially inducted into the NT&S crew. Dylan moved to the Pacific Northwest and began work as one of our “road warriors,” traveling the country on treehouse builds. Just three months after Dylan joined the crew, production began on the first-ever season of Treehouse Masters. Since then, Dylan has transitioned from work on treehouse build sites to work in our prefabrication shop. He now spends less time in front of the camera and more time behind-the-scenes creating sublime custom built-ins, from benches, to Murphy beds, to slab countertops, to shelving units. Dylan enjoys the challenge of creating built-ins and views furniture-making as the latest step in the natural progression of his carpentry career. As a young carpenter, Dylan worked on theater sets that prioritize efficiency over finesse and longevity. Theater schedules demand rapid production of sets that are primarily viewed from afar and only need to withstand the duration of a production season. Moving into treehouse construction gave Dylan a fresh challenge: unlike theater sets, treehouses are built to last. Dylan learned to build treehouses that will endure for years and that look as beautiful at close proximity as they do from afar. Once he became comfortable with building the structure of treehouses, Dylan was primed for another new challenge. Built-ins upped the ante on Dylan's carpentry skills: furniture-making demands careful attention to detail and a great deal of finesse. Dylan worked on this built-in, curved bench for the owl's Nest library treehouse. The design for this bench is based on the fibonacci spiral - you can find out how to build it here on our blog. Some of Dylan’s favorite built-ins he has created for NT&S treehouses include the curved Fibonacci bench for the Owl’s Nest Library Treehouse and the kitchenette unit (complete with walnut, checkerboard cutting boards) for the single-tree “tree-home” in Neskowin, Oregon. Dylan created this gorgeous kitchenette unit (complete with walnut, checkerboard cutting boards) for the Neskowin Treehouse. You can take our photo tour of this treehouse here on the blog. When Dylan is tasked with creating a custom built-in for a treehouse, he typically receives little design direction, leaving him ample creative freedom. To start the piece, Dylan assess his creative constraints: how much time does he have for the project? What types of slabs are available for use, and what are their features like? What’s the aesthetic of the overall treehouse? Is it more rustic and cozy, or modern and sleek? Dylan draws creative inspiration from fresh challenges and enjoys trying new methods, pushing himself toward ever-greater improvement. Nelson Treehouse and SUpply gets most of its slabs for treehouse built-ins from a small, family-owned wood mill in Oso, Wa. Read about the Wild Edge woods mill and its owner, Bruce, on our blog here. Dylan is an avid fly fisher – he learned from his father and spent summers fishing as a kid. Two years after moving to Washington State, Dylan decided to invest in fly fishing gear (rather than ski gear), as he thought it would be versatile and useful year-round in the Pacific Northwest’s temperate climate. He certainly has not regretted his decision, and now spends as much time as possible fishing in the Yakima River and on the Olympic Peninsula. Dylan engages in catch-and-release for every type of fish except one: hatchery fish. These artificially-bred fish make it harder for wild fish to survive in river ecosystems, as they compete for resources and dilute genetic immunities to diseases specific to the river systems wild fish evolved in. Dylan’s mother lives in Zimbabwe and works in end-of-life psychology and grief counseling. A few years back, she had led a few counseling groups with children at the Chiedza Childcare Centre. This nongovernmental organization offers holistic psychosocial support to vulnerable and orphaned children primarily in the Harare district. Chiedza hosts remedial education programs for kids who have dropped out of school, in order to help them catch up and reenter the school system. Chiedza also offers skills- and jobs-training programs for older teens who are unable to catch up rapidly enough to reenter school before adulthood. After teaching the class at Chiedza, Dylan traveled to treehouses in Zimbabwe, Botswana, Kenya, and Tanzania. He photographed the treehouses on Pete's request, for inclusion in Pete's book Be in a Treehouse. Dylan had some incredible experiences on his treehouse tour and met many generous, welcoming people who shared their treehouses and stories with him. One of his favorites from the trip was the One Love Island Treehouse in Kenya. The opportunity to visit the treehouse came about spontaneously, toward the end of Dylan's time in Africa. The journey to One Love Island included a crowded minibus ride, surreal nighttime canoe trip, several pitstops in villages along the way, and homemade meals hosted by kind strangers. The treehouse, made of mangrove tree wood and reeds, functions as a communal space for the people of local towns. The One Love Island Treehouse in Kenya. Photo by Dylan Rauch. Tanzania Treehouse. Photo by Dylan Rauch. 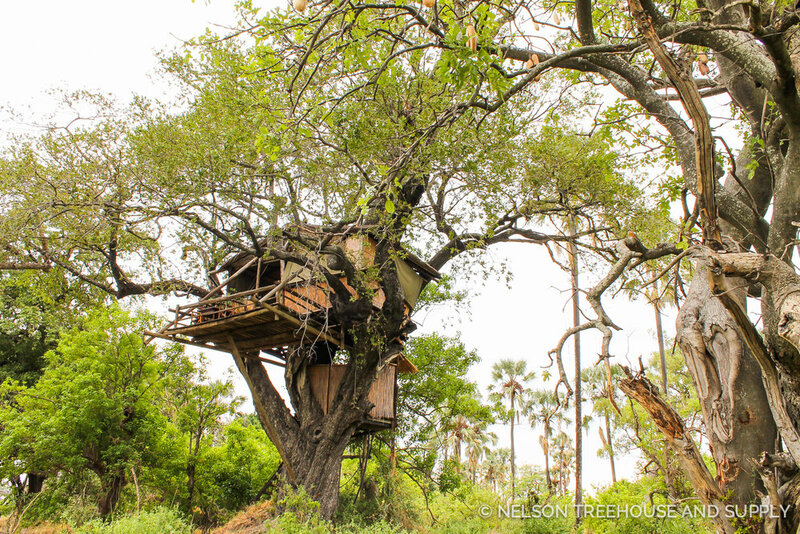 Odd ball Camp treehouse in Botswana. Photo by Dylan Rauch. Treehouse Pub in Tanzania. Photo by Dylan Rauch. If Dylan weren’t a carpenter for a living, he believes he would be a teacher. His class in Zimbabwe inspired him to teach more – back home in Washington, Dylan exercises his interest in teaching by occasionally demonstrating techniques to new NT&S carpenters. One type of teaching that Dylan has never tried but would like to do is guiding fly-fishing trips. His ideal teaching job would be to take kids from the city on trips out to the country to fish. Dylan predicts that some form of teaching is in his future within the next 10 years or so. The Flophouse – A group of friends watches movies that were critical or commercial flops and then discusses the films with great hilarity. Stuff You Should Know – Gives educational (and entertaining) lessons on how common things work, from the National Security Council, to itching; from the Aurora Borealis, to beer. The Moth – Stories told live by people from all walks of life. Orvis Fly Fishing Guide Podcast – Gives useful fishing tips from fly-fishing author Tom Rosenbauer. Hidden Brain – An NPR series that, according to the pod's website, "reveals the unconscious patterns that drive human behavior." If Dylan were to host his own podcast, he says it would unequivocally be about fishing. 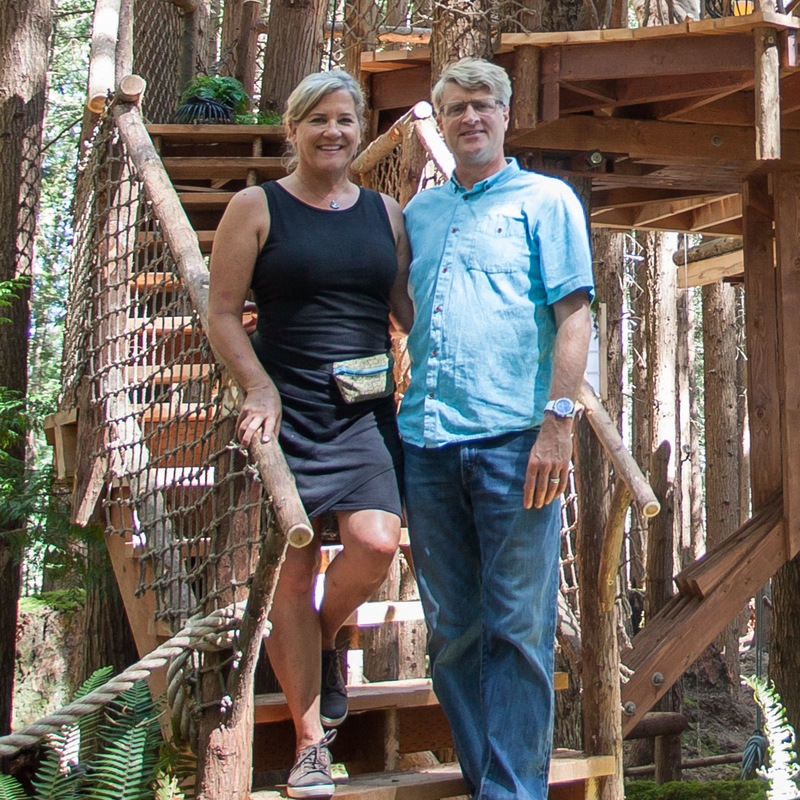 Dylan's dream treehouse would be located near a river for prime fishing access, like this treehouse (owned by Bruce of Wild edge Woods) in oso, WA. Although Dylan has traveled widely in his life, he has not yet visited South America. Dylan would like to travel to Argentina and Chile, two meccas for fly fishing. Visiting the mountains of Patagonia is also definitely on Dylan’s bucket list. Thanks for sharing your story, Dylan! To stay up-to-date on coming staff spotlights, treehouse tours, and event updates, subscribe to our newsletter and give us a follow on social media.